WebSitePulse is monitoring ten of the most popular online shopping destinations for the 2007 Valentine's Day. The measurement results from the transaction monitoring reflect the performance levels and the availability of the ten websites related to the increased Internet traffic during the period. This information is helpful to analyze the End Users' shopping experience, the reliability of the IT infrastructure of the Internet retailers, as well as their estimated losses in case of downtime and unavailability of critical websites, web pages, web systems, network devices, and web applications. 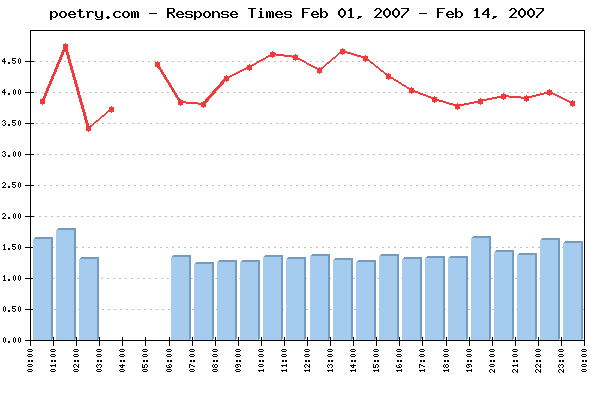 The daily Average Response time from all monitored websites was 4.206 sec. The Average Response time as measured from the US East Coast (Washington, DC) was: 3.567 sec. The Average Response time as measured from the US West Coast (San Francisco, CA) was: 4.994 sec. The Average Response time as measured from US Central (Chicago, IL) was: 4.057 sec. The Best Response time measured from the US East Coast was: 0.611 sec. The Best Response time measured from the US West Coast was: 2.418 sec. The Best Response time measured from US Central was: 0.516 sec. 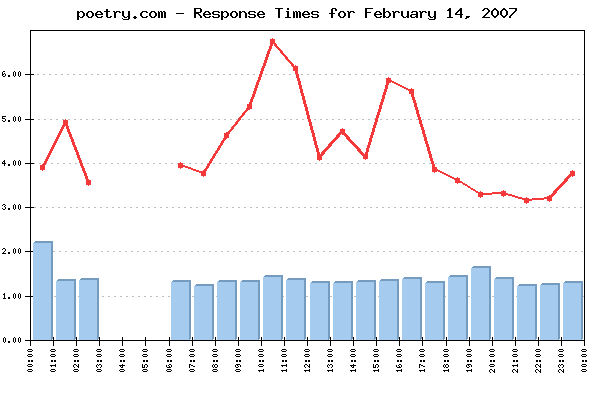 The typical transaction loading took the least time for poetry.com visitors - 1.374 sec., while the visitors of hallmark.com had to be the most patient, as the loading there took in average of 17.625 sec. 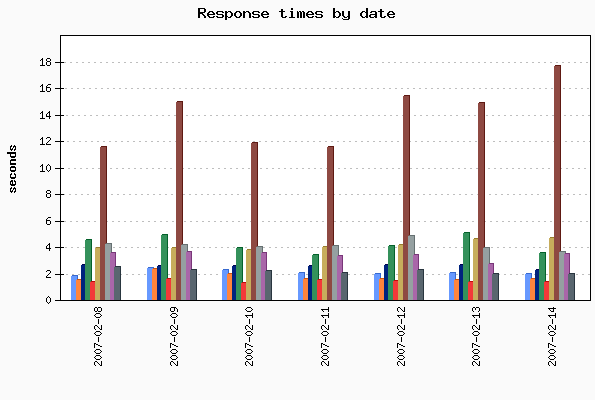 Two of the monitored websites delivered above-the-average response times for their shopping transaction, while eight of them demonstrated below-the-average daily performance. The daily average uptime for the entire Group was 99.8%. Nine websites' availability was above the average, while one site dragged the average down with below-the-average availability. At the last day of the report, the rush seemed to be over at all monitored e-tailers, except at hallmark.com, where the average response time was a record high for the whole monitored period. However, even with some timeouts detected, the Hallmark website performed much better this year - no major service interruptions were recorded. The steps in each shopping transaction - opening the home page, browsing for a product, adding product to the shopping cart, and secure check out - are comparable for all ten websites, and reflect the real online buyers' experience. The simultaneous monitoring is performed from 3 US locations of the WebSitePulse monitoring network: Chicago, IL; San Francisco, CA, and Washington, DC. In case of a detected malfunction or unavailability, the system performs automated error verification from 3 independent resources and only after the above procedure is performed and has returned consistent results, the detected error is confirmed, recorded, and included in the daily performance reports. In these cases, an advanced WebSitePulse exclusive feature comes into play - Forced Monitoring - which automatically switches to a 3 minute - monitoring interval for increased accuracy.